On 2 March a site was tweeted by @St3f4nMZ to myself and two others which claimed to show different Sundown patterns. This actually turned out to be Nebula EK. By the time I had noticed and gotten around to checking Nebula was gone and Rig EK seemed to have taken its place. The payload this time looked very strange. It looked like an information stealer but did not trigger any ET signatures and I could not find similar patterns anywhere in the wild. I ended up tweeting @Antelox who said it was August Stealer. It seemed to be a very unusual payload and was very interesting to watch. At the time having no idea what I didn’t really know what to look for. By the time it had been identified (today) I had already wiped the machine so could not investigate further. None the less this is an interesting find and I hope you enjoy it. Files and PCAP’s are below. 040317-RigAugust-> Contains pcapng and payload in password protected zip. August stealer posts encrypted data to C2. 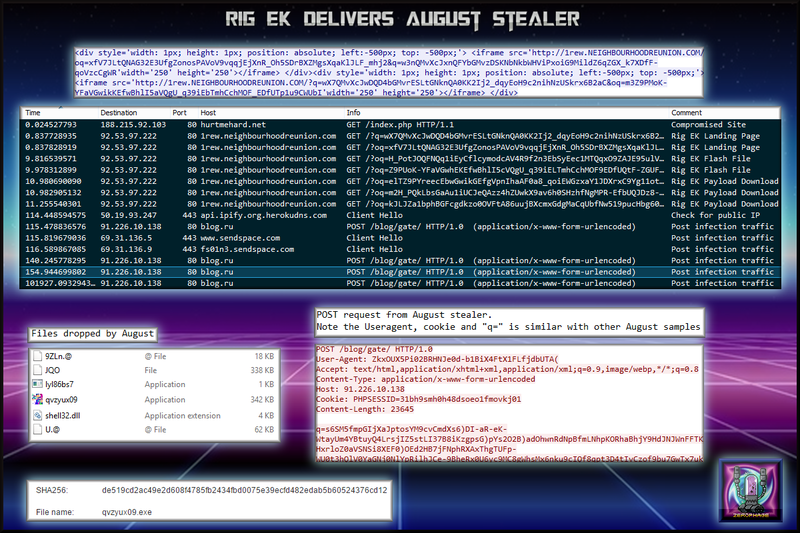 Compromised site has iframe redirecting to Rig EK. Site seemed to have two iframes which caused double landing page, etc. There was no Pre-Landing page. Dropped payload “qvzyux09.exe” which is different to the usual “rad” themed ones. I used an article from Proofpoint to confirm that it was or at least this is a variant of August. Note the user agent, cookie and data after the “q=” is very similar to my POST traffic.